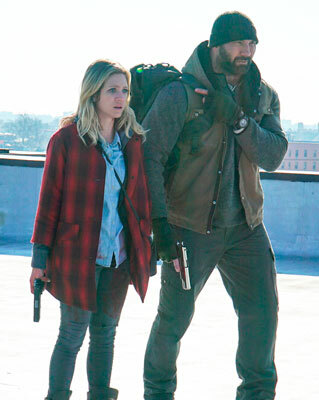 Starring Brittany Snow/Lucy, Dave Bautista/Stupe, Angelic Zambrana/Belinda, Christian Navarro/Eduardo, Myra Lucretia Taylor/Ma, Arturo Castro/Jose, Jeremie Harris/J.P. 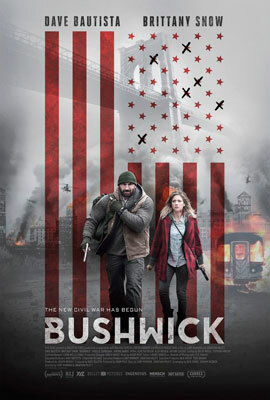 Bushwick bursts onto the screen as an apocalyptic noir thriller about the chaos of Texas withdrawing from the United States. The story wisely focuses on the ongoing battle in New York, which provides us with a more diverse and familiar experience. Most of the action follows Lucy and Stupe, who duck and dodge gunfire and the odd explosion, each intent on reaching their own safe haven. Lucy tries to understand the bigger picture while Stupe schools her in Urban Rebellion 101 and handgun safety. This desperate journey takes them on a collision course, where everyone is fighting for survival or their own political agenda. Grimly drawn, Bushwick points the finger at everyone, veering between nihilism and existential dread. This small slice of mass hysteria reminds me of the 1954 B noir gem, Riot in Cell Block 11, which took a page from the social protests surrounding prison reform. Yet the fatal flaw with Bushwick is the reliance on shock and awe to empower the ideological points, rather than laying the necessary framework with a short prologue, especially given the weak social issue. But where else could the viewer get to enjoy Myra Lucretia Taylor, who is absolutely mesmerizing as Ma?